Copenhagen has long been a hotspot for foodies, famous for its Michelin-starred restaurants and award-winning cuisine. This gourmet food tasting tour will whisk you on a gastronomic journey of Copenhagen’s West End, stopping to sample delicious smørrebrød (open faced sandwiches), sip craft brews and taste an array of cheeses, chocolates and local specialties. Meet your guide, a fellow foodie, at Vesterbros Torv, in the heart of Copenhagen’s Vesterbro district to begin your walking tour. Then, enjoy an insight into local life as you explore the vibrant neighborhood and hear how it’s transformed in recent years from a red light district to the epicenter of Copenhagen’s art, fashion and nightlife scene. Along the way, stop to take a peek at the old cattle market, pass the bars and venues of Istedgade, and stroll down the busy central boulevard of Vesterbrogade. Continue into the hip Meat Packing district, where you’ll be introduced to some of the neighborhood’s most popular restaurants, and stop to sample an array of Danish specialties. 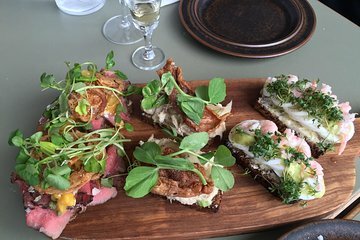 Taste delicious regional cheeses, nibble on local delicacies and enjoy a typical Copenhagen lunch of smørrebrød (open faced sandwiches). Please advise, at time of booking, if you are a vegetarian or have food allergies. Once the tour begins, there is no way of changing the tastings. Your gastronomic adventure isn’t over yet – there’s still time to stop at some artisan food boutiques, sample some homemade chocolates and pay a visit to Copenhagen’s most renowned microbrewery. Finally, with your appetite sated and plenty of recommendations for where to eat in the city from your guide, your tour ends in the center of the Vesterbro district. Nice tour and a lot of good food. Our tour guide was great.